S T Gill was born in Devon, England and emigrated to Australia with his family in 1839. He established a studio in Adelaide c1840, and took a keen interest in depicting not only the city and its environs, but also the people in them. He imported the first daguerreotype equipment to the settlement in 1845, but did not pursue the technique. In the next few years he made watercolours, drawings and lithographs of the people of Adelaide, the city itself, and significant events such as the start of Sturt's expedition into the interior. In 1846 he accompanied the explorer John Ainsworth Horrocks on an expedition to the area north of the Flinders ranges, from which he produced a considerable body of work. In 1852 Gill travelled to the goldfields at Castlemaine and after a few months moved to Melbourne. He had a studio above a bookshop in Collins Street where he transferred his drawings to lithographic stones. He published his first series of lithographs 'Victorian Gold Diggings' and 'Diggers As They Are' in Melbourne in 1852; a pirated version was published in London the following year. He published a number of other sets of lithographs of Victoria in the intervening years, which brought him fame. 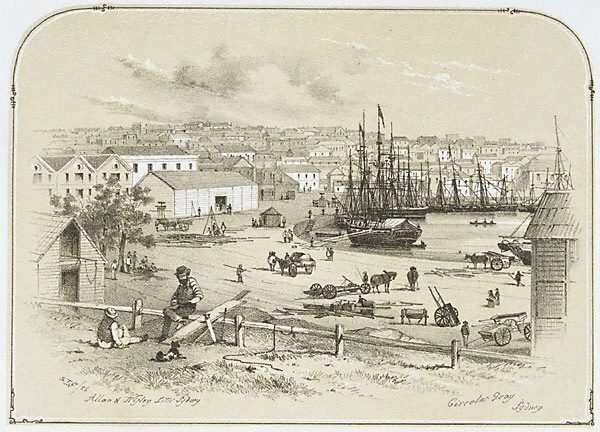 Gill arrived in Sydney from Victoria in 1856 and produced the two parts of his 'Scenery in & around Sydney' the same year. There were six plates in each part. Other views from the second part (in the Gallery's collection) include 'Dry dock, Balmain', 'General Post Office', 'Australian Club House', 'City Rail Terminus' and 'Avenue approach to the Botanical Gardens'. Signed and dated on stone to print l.l., "S.T.G./ 56".